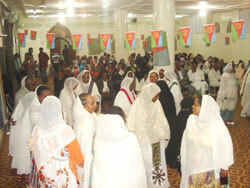 During the celebrations they conducted in connection with the 22nd Independence Day, Eritreans living in different countries expressed that national holidays are symbols of harmony and unity of the Eritrean people. Speaking on the occasion conducted in Kuwait in which Ambassadors of different countries and other invited guests were present, Mr. Osman Saleh, chairperson of Eritrean community, indicated that the specialty of the event lies on the fact that it is being celebrated at a time when anti-Eritrea agendas have ended up in utter failure and that the economic development achieved in the past 22 years of independence are vivid indicators for the bright future of the country. The participants on their part expressed readiness to back up national development programs in the Homeland. Likewise, during the celebrations they conducted, Eritrean nationals in Sana’a, Yemen, Mr. Musa Yasin, Eritrean Ambassador in Yemen, expressed appreciation for the unity of the Government and people in their efforts to develop the country that was realized through sacrifice of its sons and daughters and called on Eritrean nationals in Yemen to reinforce participation in the national development programs. Reports indicate that Eritreans residing in Seattle and Phoenix, US, celebrated the 22nd Independence Day with patriotic zeal. In a speech he delivered during the occasion, Mr. Michael Wigen, Mayor of Seattle city, said that thanks to the strong participation of Eritrean the city has become beautiful and that the unity of the Eritrean people would be good example to others. He further indicated that Seattle has been the first city to formally announce May 24, Eritrean Independence Day to become official holiday in the city. Moreover, in the celebration Eritreans living in Abu Dhabi conducted in connection with the 22nd Independence Day, Mr. Alamin Nafi’e, Charge D’Affairs of Eritrean Embassy in the Arab Emirates, gave extensive briefings on the objective situation in the Homeland, and called on citizens to reinforce participation in the national development programs. In the same development, Eritreans residing in Wuppertal and Kassel, Germany, in the celebrations they conducted in connection with the 22nd Independence Day in which representatives from different cities and friends of Eritrea took part, expressed resolve to back up national development programs.